Oil on canvas, 196 x 160 cm. 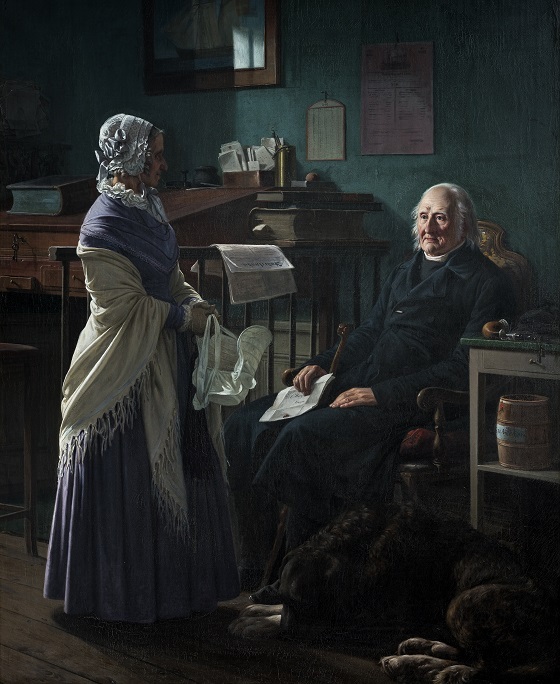 This large double portrait depicts Johannes Hage’s grandparents, the merchant Christopher Friedenreich Hage from Stege on the island of Møn and his wife, Christiane Arnette Hage. The painting was commissioned by Alfred Hage, Johannes’ father, for the occasion of the former’s parents’ golden wedding anniversary. The old married couple are depicted in a dark room with green walls. Christopher sits with a letter in his hand, still as a rock. By his foot lies the family dog Fenris, large as a horse, and before him stands his wife, 17 years younger than him, with a bonnet in her hands. She looks at her husband with a modest and sweet expression. According to the story passed down through the generations, she is asking her husband whether she can borrow the two brown horses. Christopher Friedenreich Hage died prior to the completion of this painting. Perhaps this explains his absent expression and his faithful dog’s mourning posture by his feet.